Organized at Indianapolis, Ind., and mustered in November 22, 1861. Left state for Louisville, Ky., November 27. Attached to 3rd Division, Army of the Ohio, to September, 1862. 9th Brigade, 3rd Division, 1st Corps, Army of the Ohio, to November, 1862. 3rd Brigade, 2nd Division, Right Wing 14th Army Corps, Army of the Cumberland, to January, 1863. Artillery, 2nd Division, 20th Army Corps, Army of the Cumberland, to October, 1863. Artillery, 1st Division, 4th Army Corps, Army of the Cumberland, to July, 1864. Artillery Brigade, 4th Army Corps, to September, 1864. Garrison Artillery, Chattanooga, Tenn., Dept. of the Cumberland, to November, 1864. SERVICE.--Duty at Camp Gilbert, Louisville, Ky., until December 20, 1861, and at Bacon Creek, Ky., until February, 1862. Advance on Bowling Green, Ky., and Nashville, Tenn., February 10-25. Occupation of Bowling Green, Ky., February 15, and of Nashville February 25. Moved to Murfreesboro, Tenn., March 18. Reconnaissance to Shelbyville, Tullahoma and McMinnville March 25-28. Advance on Fayetteville and Huntsville, Ala., April 7-11. Capture of Huntsville April 11. 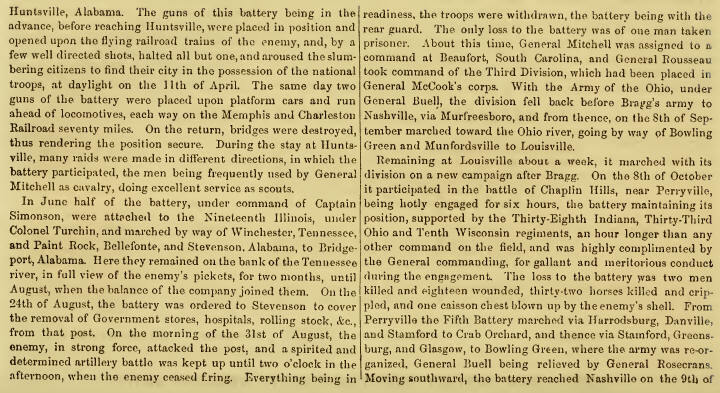 Advance on and capture of Decatur April 11-14. Duty at Bridgeport, Ala. (Detachment), and along Nashville & Chattanooga R. R. until August. Moved to Stevenson, Ala., August 24. Moved to Nashville, Tenn.; thence to Louisville, Ky., in pursuit of Bragg, August 31-September 26. Pursuit of Bragg into Kentucky October 1-15. Battle of Perryville, Ky., October 8. March to Nashville, Tenn., October 20-November 9, and duty there until December 26. Advance on Murfreesboro, Tenn., December 26-30. 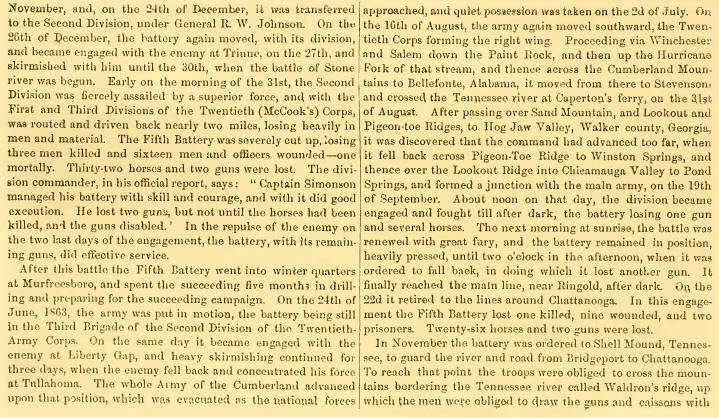 Battle of Stone's River December 30-31, 1862, and January 1-3, 1863. Duty at Murfreesboro until June. Middle Tennessee (or Tullahoma) Campaign June 22-July 7. Liberty Gap June 22-24. Occupation of Middle Tennessee until August 16. Passage of the Cumberland Mountains and Tennessee River and Chickamauga (Ga.) Campaign August 16-September 22. Battle of Chickamauga September 19-20. Siege of Chattanooga, Tenn., September 24-October 26. Reopening Tennessee River October 26-29. Outpost duty at Shellmound until February, 1864. Demonstrations on Dalton February 22-27. Tunnel Hill, Buzzard's Roost Gap and Rocky Faced Ridge February 23-25. Stone Church, near Catoosa Platform, February 27. Atlanta (Ga.) Campaign May 1 to September 8. Tunnel Hill May 6-7. Demonstration on Rocky Faced Ridge and Dalton May 8-13. Buzzard's Roost Gap May 8-9. Near Dalton May 13. Battle of Resaca May 14-15. Near Kingston May 18-19. Near Cassville May 19. Advance on Dallas May 22-25, Operations on line of Pumpkin Vine Creek and battles about Dallas, New Hope Church and Allatoona Hills May 25-June 5. Operations about Marietta and against Kenesaw Mountain June 10-July 2. Pine Hill June 11-14. Lost Mountain June 15-17. Assault on Kenesaw June 27. Ruff's Station July 4. Chattahoochie River July 5-17. Peach Tree Creek July 19-20. Siege of Atlanta July 22-August 25. Flank movement on Jonesboro August 25-30. Battle of Jonesboro August 31-September 1. Lovejoy Station September 2-6. Ordered to Chattanooga, Tenn., September 20. Veterans and Recruits transferred to 7th Indiana Battery. Mustered out November 26, 1864. Battery lost during service 1 Officer and 11 Enlisted men killed and mortally wounded and 24 Enlisted men by disease. Total 36.